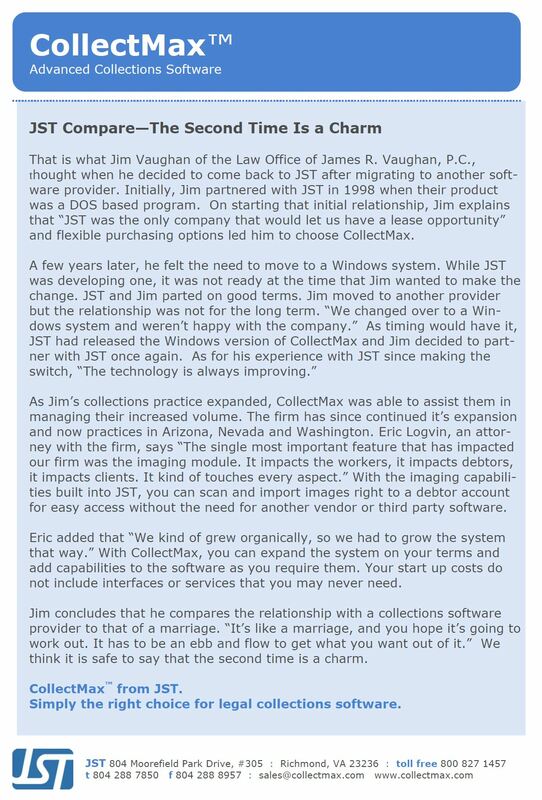 The debt collections industry has changed over the past 30 years, and so has CollectMax. 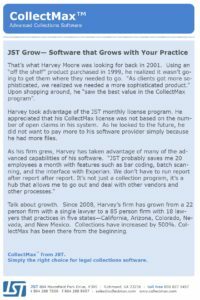 As an innovative leader in the industry, JST has been providing advanced collections software to over 900 customers nationwide. Now more than ever the focus is not only on collection rates but also on managing client expectations and compliance guidelines. 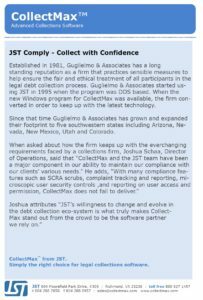 Let us show you how CollectMax™ can help you manage your collection efforts. Contact JST for additional information or to schedule a free live demonstration. Click here for CollectMax System Requirements. Stay on top of compliance requirements and risk management. 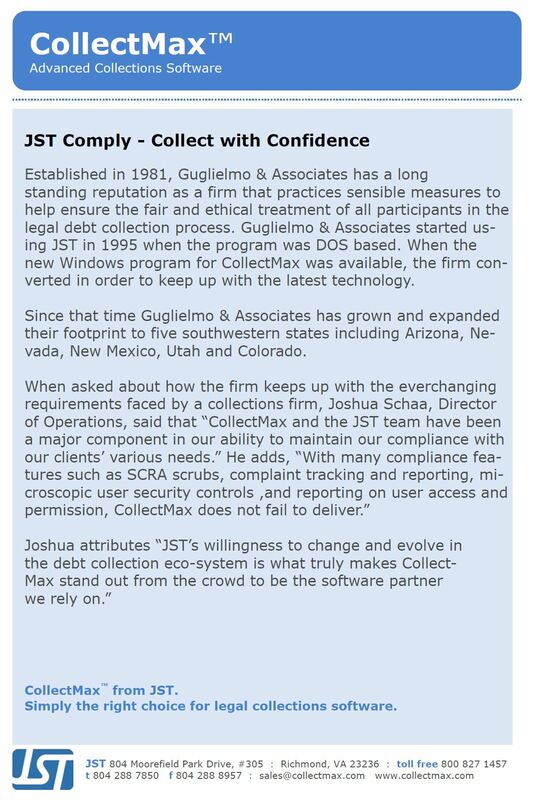 With CollectMaxTM, compliance is managed without the need for third party software. 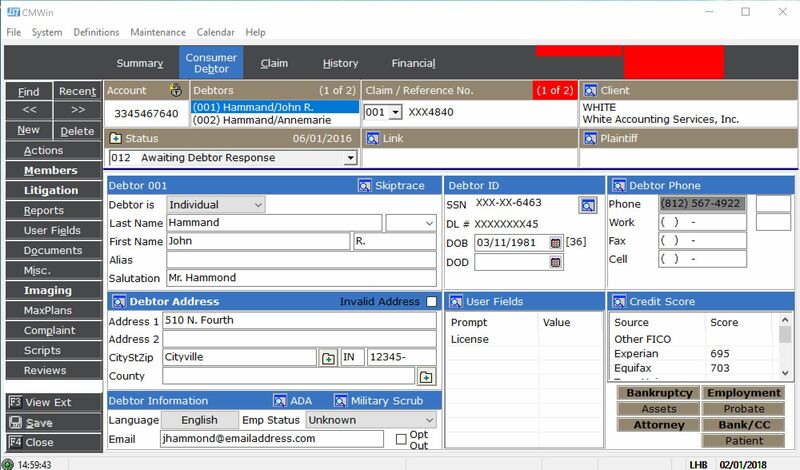 An integrated complaint and dispute tracking system assists with compliance record keeping by logging and monitoring issues from consumers and regulatory authorities. To prevent a common mistake, the consumer’s phone number is not viewable when it is not within allowable time call parameters. Stay on top of security and data access. MaxSecurity tracks every user who accesses an account, provides audit reports and addresses PCI compliance standards. Accounts can be locked from view to allow only access by a supervisor until unlocked. 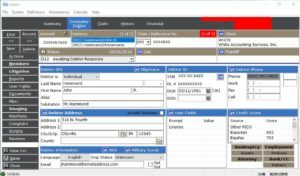 Sensitive data such as consumer account numbers or SSN’s can be masked from the user’s view to meet compliance requirements. Disabling the print button or requiring a password prior to printing provides an extra level of security against producing hard copies of data. Stay on top of document compliance. CollectMaxTM can suppress document generation for accounts that have a Do Not Contact flag, a defending attorney or are in bankruptcy. Documents can be suppressed by assigned client or user to prevent accidental production. MaxPlans assure that the proper documents are generated for each account right on schedule. Compare the total cost of ownership. 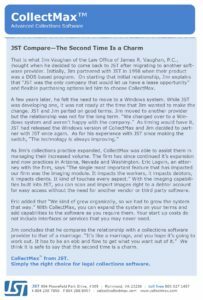 The total cost of collections software is more than just the initial price to get started. Consider long term expenses for ongoing support, maintenance and version upgrades. From low cost of entry and advanced upgrades to expert support, CollectMax™ is an outstanding value. Compare the cost of expansion. CollectMax™ offers an unlimited number of debtor and client accounts. Services and interfaces can be added when and if your practice requires them. Other providers have a license fee for volume upgrades, and bundle interfaces you may never need into initial start up costs. 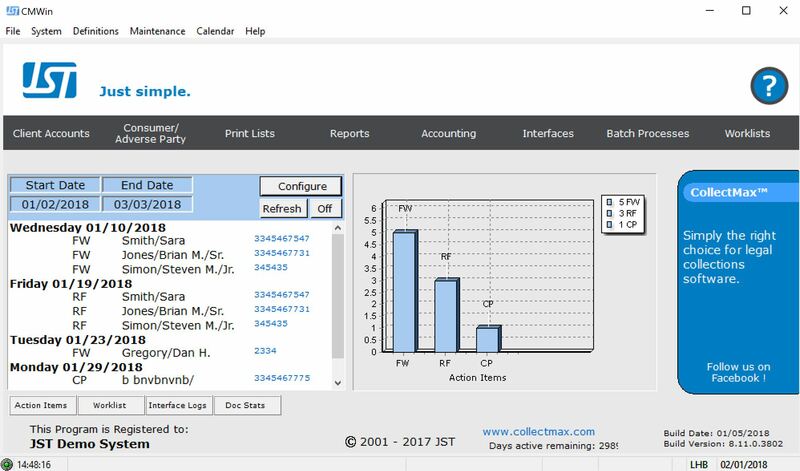 The CollectMax™ user interface is simple by design, without sacrificing advanced capabilities. Your staff spends more time working and less time training. 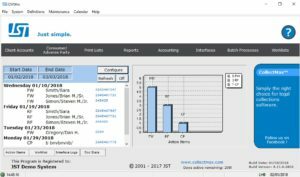 Take a close look by scheduling an online demonstration. 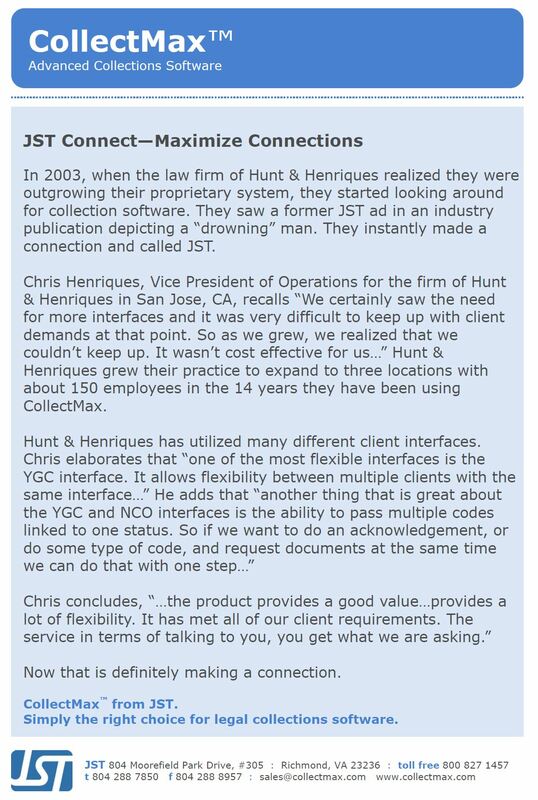 JST partners with leaders in the collection industry to offer interfaces to many of the marketplace’s most widely used and respected vendor service providers. We are known for our well designed interface programs and responsiveness to changing customer requirements. Whether you are looking for a dialer system or skip tracing service, JST has options to choose from. And we develop interfaces that can be used with several service providers, so you can select the company that best suits your needs. 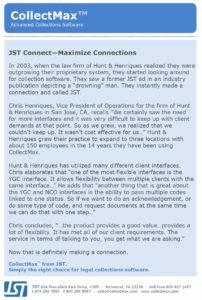 JST supports industry organizations such as NARCA, CLLA, DBA International and the ACA and regularly hosts user gatherings at conferences. There are also other opportunities to connect with other users via meetings as well as online. Software that grows with your practice. Why pay for what you don’t need? 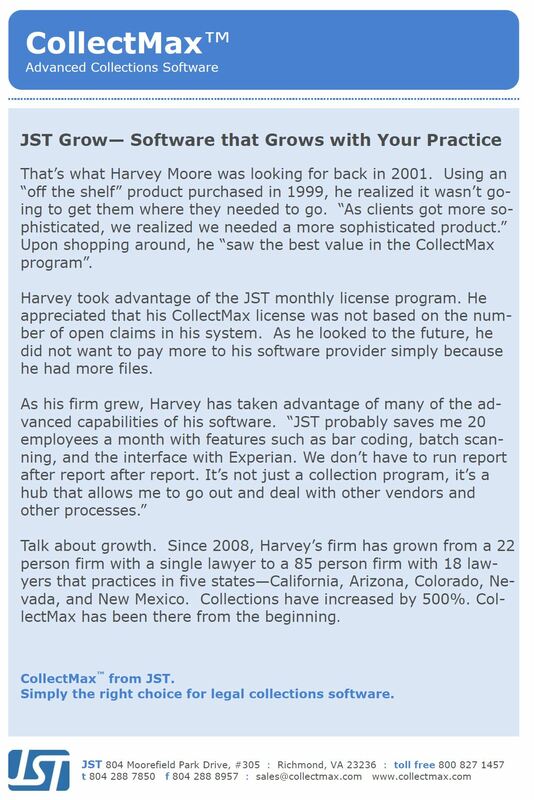 JST offers monthly subscription programs starting at $250 a month, allowing you to grow and expand your practice as you need it. Software that gets you up and running. With CollectMax™, your staff can start being productive right away. The program is easy to use and our support team will assist you with the initial set up. Your staff can start working right away, without lengthy training. Software that takes you to the next level. No matter how quickly your practice grows, or how big it gets, you’ll be ready with reliable and expandable software supported by a company with more than 20 years of experience.